The drug is manufactured in 50 and 100 ml polymeric and glass bottles. Combined antibacterial drug which is active against most of animal bacterial infections. Combined action of two different group antibiotics increases term of resistant pathogenic microorganism appearance. 1 ml of Hentaflox solution for injections contains enrofloxacin - 65 mg and gentamicin sulfate - 30 mg (as active ingredients), as well as excipients. 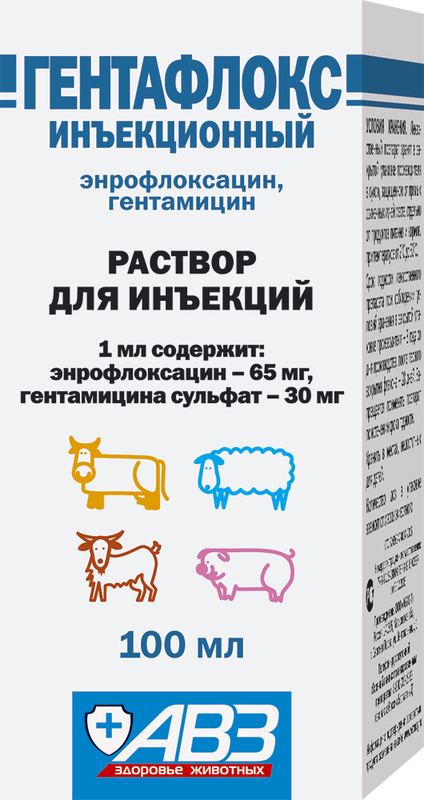 Hentaflox solution for injections is a combined antibacterial drug. Enrofloxacin (a fluroquinolone compound) is active against most of gram-positive and gram-negative bacteria (including Pseudomonas aeruginosa, Klebsiella spp., Escherichia coli, Enterobacter spp., Campylobacter spp., Shigella spp., Haemophilus spp., Salmonella spp., Aeromonas spp., Proteus mirabilis, Staphylococcus spp., Mycoplasma spp. and Chlamydia spp.). Mechanism of enrofloxacin antibacterial action involves bacterial DNA gyrase inhibition. Enrofloxacin easily absorbs from injection site and penetrates within most of organs and tissues. It obtains peak blood concentration in 0.5-1 hour after parenteral administration. Therapeutic concentration remains within 24 hours. Enrofloxacin is partially metabolized in liver with further formation of active metabolite (ciprofloxacin). It is excreted, mainly, in urine and bile, as well as in milk of lactating females. Gentamicin sulfate (an aminoglycoside antibiotic) is active against most of gram-positive and gram-negative bacteria (including Streptococcus spp., Staphylococcus spp., Escherichia coli, Proteus spp., Enterobacter spp., Klebsiella pneumonia, Shigella spp., Pseudomonas aeruginosa, Clostridium spp., Treponema hyodysenteriae, Corynebacterium spp.). Mechanism of gentamicin antibacterial action involves protein synthesis inhibition at ribosomal level of microbial cell. Gentamicin rapidly absorbs from injection site and distributes within most of organs and tissues. It obtains peak concentrations in 0.5-1 hour after parenteral administration. Mainly, it is excreted unchanged in urine. mycoplasmosis, mastitis-metritis-agalactia syndrome), as well as other primary and secondary bacterial infections, agents of which are susceptible to enrofloxacin and gentamicin. Increased individual sensitivity to the drug components, frank hepatic and/or renal impairment. Do not use in pregnant and lactating females, as well as in newborn animals. It is not allowed to use in milking animals with esculent milk. Do not use Hentaflox in combination with bacteriostatic antibiotics (levomycetin, macrolides, tetracyclines, sulfanilamides) due to potential antagonistic effect, theophyllin, polyether ionophores, nonsteroidal anti-inflammatory drugs. 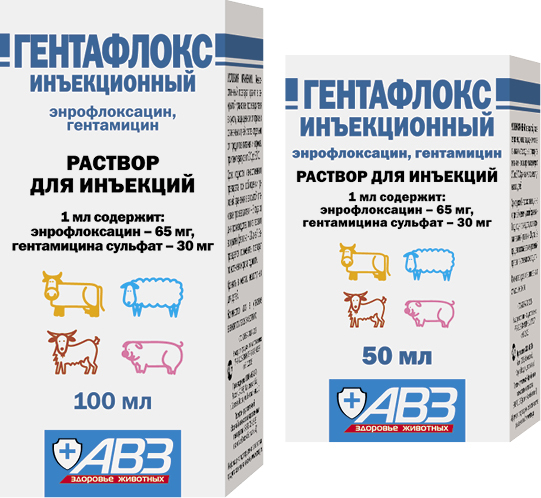 • sheep, goats and calves - subcutaneous administration within 3-5 days. 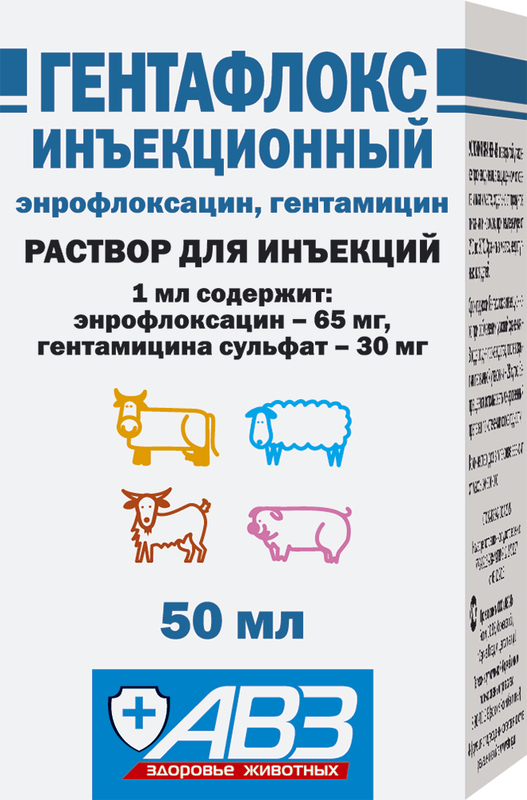 Due to potential pain reaction, maximum volume of the drug to be administered in the same site is 5 ml (sheep, goats, calves and pigs) and 2.5 ml (piglets). Adverse events and complications are not generally observed in case of administration as per this package insert. In case of increased individual sensitivity to the drug components and allergic reactions (cutaneous eruptions, itch, angioneurotic oedema), stop drug administration. Use antihistaminic and symptomatic drugs. Calves, sheep and goats are allowed to be slaughtered for meat not earlier than 60 days after the last drug administration. This term is 40 days in pigs. Meat of compulsorily slaughtered animals received before stated period termination can be used to feed fur animals. Shelf life is 3 years from manufacturing date and 28 days from primary package opening.